The New York City Freestyle Pass offers flexibility, convenience, iconic sightseeing and entry into some of the coolest NYC attractions! You’ll have full access to all 3 hop-on, hop-off bus loops through Uptown, Downtown and Brooklyn. 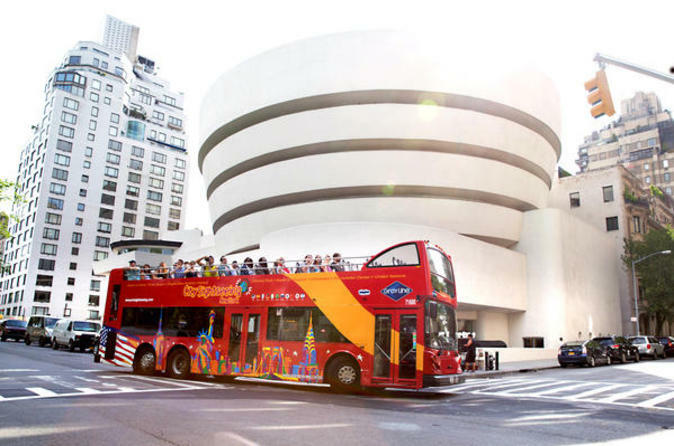 Sit back and enjoy double-decker views as professional guides point out world-famous landmarks, including Times Square, the Empire State Building, Madison Square Garden, Rockefeller Center, the Brooklyn Bridge, and the Statue of Liberty! In all, you’ll see 40+ top attractions and learn the background of New York’s neighborhoods, from the classic to the most eccentric. Your Pass also includes admission to the top attractions of your choice! Just select a 3-attraction pass, 5-attraction pass or 7-attraction pass and choose from the list of the city’s most popular attractions. This hop-on hop-off pass is the easiest and most fun way to get around sprawling New York City. Explore this thriving metropolis at your own pace, as the pass is good for 72 hours. You’ll have as much time as you like at your selected destinations and can then just hop back on the next deluxe double-decker bus (arrives every 20–30 minutes). In addition to hassle-free transportation that is an activity in itself, tickets to three, five or seven attractions are included. Choose from New York’s most iconic destinations, like the Top of the Rock’s observation deck, Radio City Music Hall, Lincoln Center and more. Listen to your entertaining and informative guide illuminate the city with stories of how it came to be what it is today. Explore New York’s diverse neighborhoods and must-see places on your own. Use this all-access pass to get back on the bus at your leisure, and it’s on to the next destination of your choosing: walk through Central Park, the most-visited public park in the US; take in the exciting chaos of Times Square; get an art fix at the Guggenheim; peruse SoHo’s trendy shops; or eat your way through Chinatown and Little Italy. Whatever you choose, you’ll have three full days to explore more than 40 stops. If you choose to do an entire loop, each of the three loops takes between two and three hours to complete. And if you’re not able to fit in everything you’d like to during the day, this pass also offers the opportunity to embark on a night tour (not hop-on hop-off) to see New York’s dazzling lights from the top of the open-air, double-decker bus. If you choose that option, hop aboard (and get your camera ready) to see sparkling Times Square, the Brooklyn and Manhattan bridges, the Empire State Building and more.